Durood E Ibrahimi is Afzal for all the Muslims around the world. The one who recites it and sends this Durood on Prophet Muhammad (Peace Be Upon Him), then Allah will shower countless blessings on him and he will always feel peace and be happy. Allahumma SalliI Ala Muhammadiw Wa Ala Aali Muhammadin Kamaa Sal’laita Ala Ibrahima Wa Ala Aali Ibrahima Inna’ka Hamidum Majid. Allahumma Baarik Ala Muhammadiw Wa Ala Aali Muhammadin Kamaa Baarakta Ala Ibrahima Wa Ala Aali Ibrahima Inna’ka Hamidum Majid. O Allah, let Your Blessings come upon Muhammad (Peace Be Upon Him) and the family of Muhammad (Peace Be Upon Him), as you have blessed Ibrahim and his family. Truly, You are Praiseworthy and Glorious. Allah, bless Muhammad and the family of Muhammad, as you have blessed Ibrahim and his family. Truly, You are Praiseworthy and Glorious. The mentioned Darood-e-Ibrahim is a great gift for all the Muslims around the world to show their unlimited respect and love by sending this Durood-e-Ibrahimi daily on Prophet Muhammad (P.B.U.H). There are many benefits of Darood-e-Ibrahimi for the one who recites it daily with affection and respect. Moreover, this Darood reflects one’s true love and affection towards Prophet Muhammad (P.B.U.H). Prophet Muhammad (P.B.U.H) said: “On the day of Judgment the person closest to me will be the one who has sent the most Durood into me.” [Tirmidhi]. On Friday, send Durood abundantly to me, as it is presented before me.” [Abu Dawud]. “Whoever supplicates Allah to exult for me, Allah would exalt him ten times.” [Muslim]. One who recites Durood Ibrahim 10 times in the morning and ten times in the evening, then he will receive the help of Holy Prophet Muhammad (Peace Be Upon Him) on the final day. Moreover, One who recites Durood-e-Ibrahimi maximum time a day and Allah will accept all his prayers (Dua) and fulfill all his Hajat. Since, Durood-e-Ibrahim is a source of acceptance of Dua. Allah accepts your all supplications if you sent a Darood on Prophet Muhammad (Peace Be Upon Him). 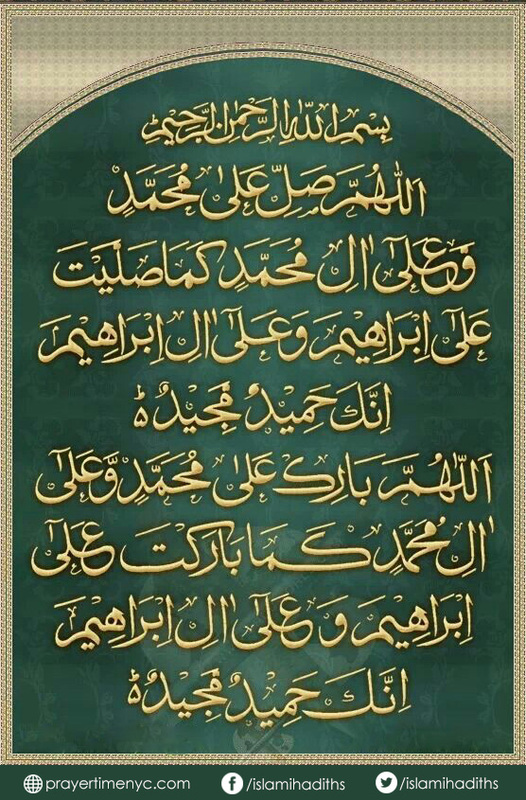 When you are angry, recite this Durood-e-Pak. Insha-Allah! Allah will solve your all problem. In the end, Darood-E-Ibrahimi is done for asking Allah’s​ mercy and blessings on the Prophet Muhammad (Peace Be Upon Him) to show your love and gratitude towards Muhammad (PBUH).